The first thing you should know about the above video is that it’s remarkably positive. The second is that it’s a powerful lesson in what to do when loss upends your life. Scarlett Lewis’s world was shattered on December 14, 2012, when her 6-year-old son Jesse was murdered at Sandy Hook Elementary School. But the single mom didn’t let grief or rage or hate consume her. Instead, she funnelled her sorrow into a new calling. Instead, she found inspiration in an oddly grown-up phrase that Jesse, shortly before he died, had scrawled on her kitchen chalkboard: Nurturing, Healing Love. As she spoke with therapists and grief counselors in the days following the tragedy, she learned that “nurturing, healing love” is an idea fundamental to a curriculum called social and emotional learning or SEL, which has been taught in some schools since the 1990s. Lewis had never heard of SEL, which some might refer to simply as life skills. The curriculum was developed by educators after the publication of Daniel Goleman’s 1995 best-seller, Emotional Intelligence. Backed by science, the program teaches kids how to manage their emotions in a healthy way. In numerous studies, it has been shown to reduce violent behavior, emotional distress and drug use, while improving mental health, social skills and academic scores. As soon as she learned more about SEL, Lewis knew she had to get the curriculum into more schools. She realized that many school districts simply didn’t know about it; others were too focused on the status quo to try something new. “I had to spend the rest of my life in service, making sure that this preventable tragedy didn’t happen again,” she says. She formed the Jesse Lewis Choose Love Movement, a 501(c)(3) nonprofit, and worked with educators to develop a specialized SEL curriculum that encourages kids to replace negative thoughts with positive ones. “When we react in anger, hatred and resentment, we give our personal power away, we become victims and we do not add value to the world,” she says. 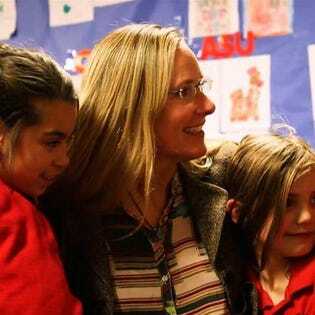 Her program teaches kids how to “choose love” by responding instead with kindness, forgiveness and compassion. Others agree with the importance of her work. To date, the Choose Love program has been downloaded by about 20,000 educators in all 50 states, reaching an estimated 1.5 million children. Last year, the organization received a $600,000 grant from the NoVo Foundation, the charity formed by Warren Buffett’s son, Peter, and his wife Jennifer. In July, the state of New Hampshire announced it would include the Choose Love curriculum into schools. Lewis isn’t leading the life she expected. Tragic circumstances led her to start a social enterprise, and she now spends the majority of her time on the road, meeting with educators, school districts and community leaders to convince them to try SEL. She is also proof that the curriculum can work for anyone, not just schoolchildren. By learning how to manage her own emotions, she was able to rise above the dark thoughts that could have engulfed her. Read a full profile of Scarlett Lewis on The Story Exchange.